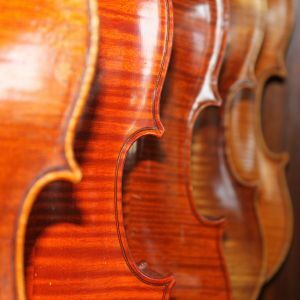 The viola, with its velvet tone, is many people’s favourite instrument. Mozart played the viola and was fond of writing for it. Beverley has produced a number of fine viola players over the years, not least due to the inspiration of the late David Atkinson, himself a Beverley man, who taught generations of youngsters and tutored the viola section of the East Riding Youth Orchestra. We are therefore delighted to be showcasing this beautiful instrument at several key moments in the festival. Outstanding violist, Simon Tandree, will give a rare performance with artistic director Libby Burgess of Benjamin Britten’s short masterpiece, Lachrymae for viola and piano, in our Sunday matinee Shakespeare celebration at East Riding Theatre. Other viola highlights include Duruflé’s evocative Prélude, récitatif et variations in Friday’s lunchtime concert at St. Mary’s in which Simon and Libby will be joined by local flautist Ian Denley, and Brahms’ Two songs for alto, viola and piano in the Saturday coffee concert at St. Mary’s in which Simon and Libby will team-up with mezzo-soprano Anna Huntley for a performance of these gorgeous songs. Come along to any of these incredible concerts to discover for yourself the rich and mellow sound of the viola. David Atkinson enjoyed the occasional pint at Nellie’s (aka the White Horse), one of Beverley’s classic pubs. Why not pop into Nellie’s during the festival and raise a glass to David? By coincidence, Beverley has another fascinating connection with the viola. For Viola was the name given to a trawler built in 1906 on the banks of the River Hull at a shipyard in Beverley, which went on be an unsung heroine of the First World War. Viola was one of hundreds like her made for fishing duties in the North Sea. But at the outbreak of the war, this little ship was requisitioned by the Admiralty and spent almost the entire conflict at sea, patrolling for mines and submarines. Viola has survived to this day, but lies rusting at Grytviken, a deserted whaling station in Cumberland Bay on the remote South Atlantic island of South Georgia. Read her remarkable story here and here. During the Festival, take a stroll along Beverley Beck, reflect and enjoy some stunning views of the Minster. Lest we forget will be a moving war commemoration concert, featuring some of the greatest chamber music of the twentieth century. In the Edwardian setting of the East Riding Theatre, this Friday night concert includes Elgar’s passionate Violin Sonata played by Alexandra Reid, some poignant songs of Ivor Gurney sung by Alexander Robin Baker and Shostakovich’s powerful String Quartet No. 8 dedicated to the victims of fascism and war. See the full programme here. *A viola burns longer. Viola jokes have been around for a while. A selection of them can be found here and here. The British Viola Society publishes a selection of violin jokes here.